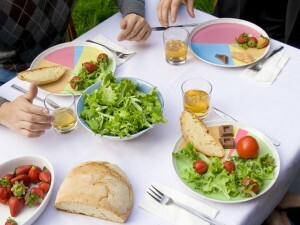 Wheel of nutrition: The dinner plate that helps you eat healthy – ¿¡ tjongolongo ?! Are you one of those persons that never knows how much vegetables you need to eat and how much meat you can have etc? Well, there is a solution for you now. Hafsteinn Juliusson, Rui Pereira and Joana Pais have created the Wheel of Nutrition. A dinner plate that visualizes how big your portion of each food type should be. The plate comes in three types: Diet, Extra ordinary and Supersize. So there’s a plate for everyone out there! Obviously you will never really be able to get the exact way it says on the plate but I do think this is a fun concept. Seeing on a plate how big or small the portion of what you may eat should be makes you think. Once you’ve filled up your plate with food you can put it on the Mandometer so it’ll tell you when you’re eating too fast as well! I actually think that if you’re in the business of helping people lose weight you can use these plates to illustrate to people how much they are allowed to eat in a fun way. The plates obviously are not meant to be your ticket to weight loss and a healthy life, that’s just up to you. But it can help people visualize better roughly how much than can have per portion. I don’t really think there’s an exact science behind the plates anyway. Tjongolongo, I don’t think I’ll be seeing people eating from these plates anytime soon, but I do think it’s a fun and creative concept. What do you think?